September saw a slight dip in multifamily rents, but the grand picture is still rosy overall. It notes, though, national rents have grown 3.1 percent over the first three quarters, which exceeded market expectations. Phoenix’s market strength is evidenced by its rent growth across market segments. With a growth rate of 5.4 percent, the city was third overall when measured across all asset classes. Growth in lifestyle rentals showed Phoenix at more than 4 percent – sixth nationally – and the city rated second overall in the renter-by necessity class with growth of more than 6 percent. After bottoming out at 95.0 percent at the end of 2017 and carrying into this year, rates have crept back up to 95.4 percent. Properties in the Renter-by-Necessity segment hit an even higher rate of 95.6. “Long-term demand for rentals is likely to remain high for a variety of demographic and social reasons,” the report predicts. “The renter-age population is growing, the economy is strong and there is demand from retirees downsizing from single-family houses,” all of which have significantly impacted the multifamily rental market in recent years. 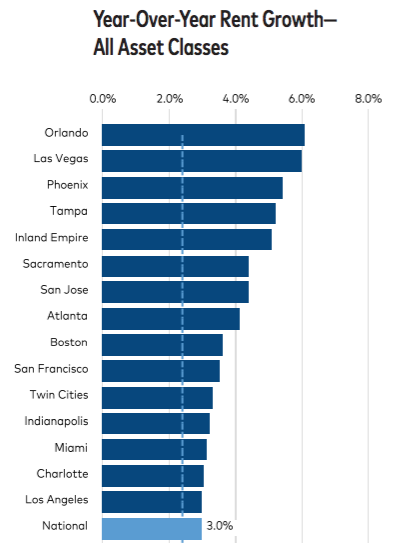 At the metro level, particularly in Phoenix and other cities with a strong delivery pipeline, occupancy rates have rebounded. Phoenix gained 0.4 percent. “Basically, demand was strong and the market has been able to absorb the excess units over time. Deliveries will remain in the 300,000-unit range through 2019,” the report said. Many of the top 30 markets can expect to see “moderate to healthy growth” in multifamily over the year to come, mainly because of employment gains and occupancy increases.